No exhaustive post today. I’m not exhausted, either, after getting my first good night’s rest since leaving Portland. Didn’t do much in the early part of the day. 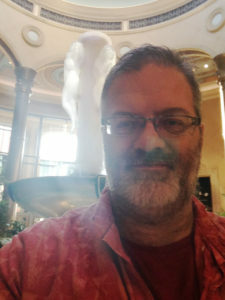 I had been scheduled to cover the first day of the Colossus, but due to a couple of live reporters wanting to play the Casino Employees event, that went on my ticket, so I had about 36 hours until my next event, the afternoon flight of the second day of entries. I did head over to a computer shop here in town to get some RAM for my trusty MacBook. I’d intended to upgrade the memory for a while. It’s one of the late 2008 aluminum-body models that came with 2GB of RAM, which was perfectly fine a couple of years ago, when I started to do some 3D modeling in Cinema 4D for a Civil War battlefield visitor’s center, but the newer operation system upgrades have made it grind to a halt just opening Safari. A very nice young tech named Jessica at Century 23 here in Vegas had the 4GB modules I needed in stock and popped them in for me in just a few minutes. Went back to the house, rested for a while, then headed out to the Venetian for the 7pm bounty tournament (Deepstack Extravaganza #14). I chipped up quickly, knocked out an angry old man who was like a tall version of Portland’s Sleepy Don, took another bounty from a kid with a Muckleshoot cap, then lost a race against a female player from Portland, and doubled up another player when I called his all-in with A♥T♥ on a QxTx6x board. He showed KxKx, I got an ace on the turn, then the jack on the river took a big chunk of my chips. My final downfall was when I shoved K♣9♠ from the button and QxJx called all in with a shorter stack from the small blind. I had him covered by 600 chips at 800/1.6K/200, he caught a jack on the flop and stayed ahead. I went out the next hand. A♦️9♦️K♣️Q♣️A♠️ falls short on T♦️9♥️6♦️ 3-way allin on flop to turned set of jacks. Of course, the guy who was driving the action on the flop lost everything, too. Big O is The Devil’s Game. Headed home after managing to turn a partial loss into a total loss. Slept like a baby in the A/C. Off to cover the second day of the Colossus today! This entry was posted in General Poker, Live Games, No Limit Hold'em, Pot Limit Omaha, Ring Games, Tournaments by Poker Mutant. Bookmark the permalink.